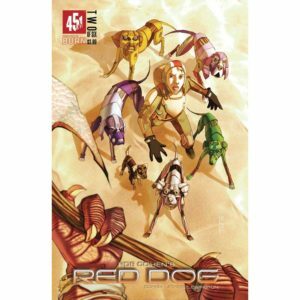 The first issue of Red Dog came out in November, and like all good bi-monthly books, it has held its secrets well. 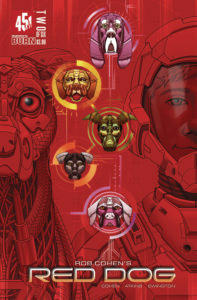 For those of you who missed issue #1, Kyle is the only kid in a human mining colony on planet Kirawan. His only playmate a cyber canine named “Q” given to him by Jake, one of his Dad’s close friends. We also learn that he is the only kid because his brother died, and his parents still mourn his brother’s death, but maybe haven’t dealt with it because they shipped out right afterwards. His Dad is in charge of all mining operations on Kirwan. At the end of issue #1, Kyle sneaks outside to view an upload of resources headed for Earth, just as the miners are attacked by the native Kirawans. 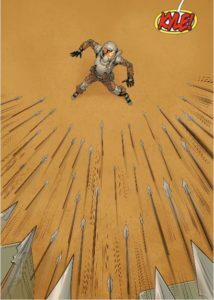 Issue Two opens with the end and repercussions of this skirmish, and what kind of trouble Kyle is in. Apparently, none of the colonists assigned to this settlement were supposed to bring children, but his parents had insisted. After Kyle is grounded and sent to his room, he hears his Dad say that he should have never brought Kyle along. Q comforts Kyle, his only friend. Jake drops by to give Kyle his birthday present (did we forget to say it was his birthday in issue #1? 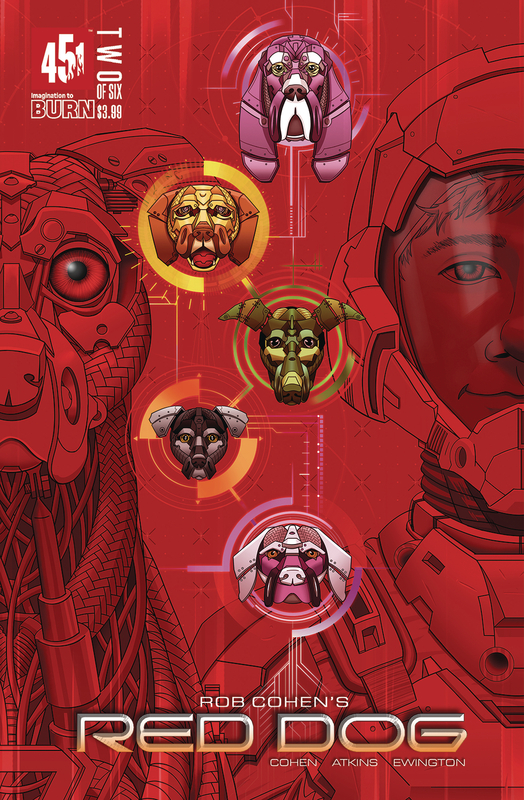 ), an expansion to Q’s “pack” – five new dogs for Kyle to work into a cyber canine team. Jake says if he can do this, he’s well on his way to making Jake’s tech team. We are treated to a selection of Kyle’s interactions with the team, and in a short time he’s ready to show Jake his progress with the pack. 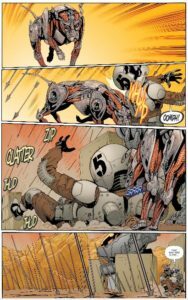 The story seems to slow down a little in this issue, to give us more of an idea of life on Kirwan without making anything too obvious. Cohen and Ewington are leaving us little gems of information that I’m sure will shine later. I already have a few theories on where this is going. 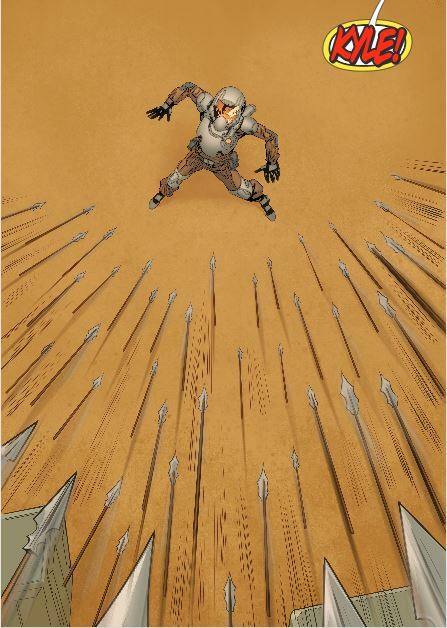 We know that a bigger confrontation with the Kirawans is brewing – Atkins and his ink-slinging team have made the natives too fierce-looking to have them turned away by a bomb , and despite being savage in appearance, they have armor and weapons. 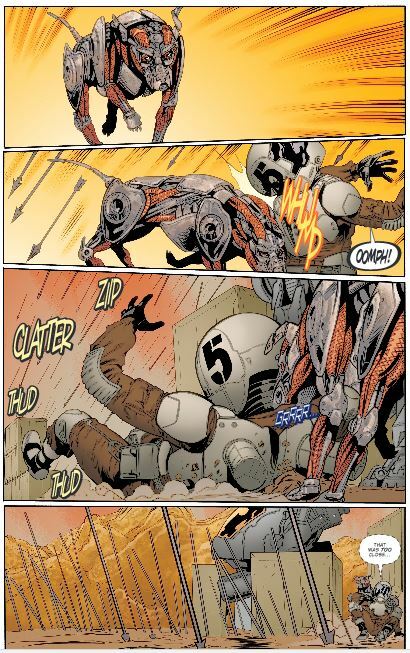 The tech that the miners employ is pretty cool itself – mecha protection bots, grenades that burrow into the ground and explode, and armor that’s vaguely storm-trooperish. Rauch is keeping the “sun shines all the time” glow to the landscape, and Esposito’s letters almost make you think the natives speak a language you understand. Did the mining company negotiate the tech upgrade for the Kirwans for mineral rights? How are the miners (or the mining company) undercutting them so that they feel their only recourse is to attack? Or are they just war-like savages? And what’s up with Kyle? Is he just one of those tech-obsessed kids, or is there more to him? Is he the Kirawanian “Chosen One?” Will we ever see dusk on the planet with the everlasting day? And how ABOUT those dogs? Can’t wait for March, when issue #3 comes out.